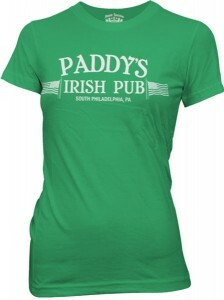 Get your official Paddy’s Irish pub t-shirt, from the cool television series It’s Always Aunny in Philadelphia. This is a great t-shirt for St.Patricks day or any day, with a nice Irish green color and the logo of Paddy’s on the front that says “Paddy’s Irish Pub South Philadelphia, PA”. Made from 100% cotton a very durable and really soft and comfortable t-shirt that will be loved by all other fans of the show It’s Always Sunny in Philadelphia. Get your It’s Always Sunny In Philadelphia Paddy’s Irish Pub T-Shirt.